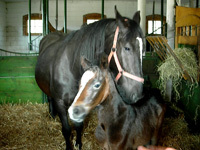 We would like to invite you to our stable "Grand" which is located in Glina near Otwock. 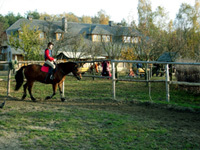 In our offer we have horse riding in the beautiful surroundings or in riding school. If you like nature and animals, it's a place to come. You can meet here as well five goats, two sheep, six cats, five dogs, the whole herd of pigeons , bees in hives, gnats at dusk , pheasants, hedgehogs, roe- deer and wild boars just behind the fence. In the summer you can go for a walk, mushroom picking, ride a bike, horse ride and in the winter we can organize the sledging in the nearest Mazovian scenery park. After the daily activity you are welcome to sit and make yourself warm and comfortable at the fire place or in sauna. You can sing as well at the piano in the bar. We can offer you as well the accommodation in the cozy, 2- bedroom rooms, each with bathroom. If you are the workaholic when resting you can have as well access to internet and for people who can't live without TV, there is a satellite TV in each room. Of course if you do not use it you will fill like in the real country. Visiting us you can take with you your favor pet. One more to those we already have doesn't make a difference. You are more than welcome to visit us. It's really worth coming. The history of our estate started in 1938 when the former owner of this land Mr. Franciszek Zawadzki sold this land to my grandparents Piotr and Stanisława Grajda. The land was called "Good Farmland" My grandparents moved to their new house with my dad, Henryk Grajda and my two aunts Maria and Teresa. In 1956 my dad married my mom Ala Witan. Just after wedding they both have lived in village Wola Ducka with my other grandparents Franciszka and Władysław Witan. My grandparents Grajda had passed part of their land to my parents, where my dad and mom have built their house. They moved to our family house in 1958 with my sister Hania. The winds of the history have blown away my family to Warsaw in 1964, but my parents have never sold the house and land, which was waiting for me. I have moved here to my family house , after finishing studies at the Main School of Agriculture. Thanks to my beloved grandpa Władysław Witan and my uncle Ryszard Bakuła, the love to land and animals, specially horses was inoculated to me, the boy from Zoliborz. Masters degree in Agriculture added the reliable knowledge to this passion. I hope that my passion I will pass to a lot of other people, specially those who doesn't know the country. You are always welcome at Stables GRAND, good farmland for everyone.